/One/: English was not your first language, yet your write in the language. How is this an advantage and a disadvantage to you? Laila Lalami: I grew up speaking both Moroccan Arabic and French, but my earliest exposure to books came through French because I received a semi-colonial education that emphasized French more than Arabic. Nearly all of the children’s literature that I was exposed to as a child was in French, so when I started writing fiction, it was in that language. While I could read and write Arabic competently enough, I found it very hard to write fictional narrative in Arabic. My use of French in fiction isn’t at all that unusual for a Moroccan writer of my generation (witness, for instance, the work of Fouad Laroui, or Abdellah Taia, or Nadia Chafik, or Driss Ksikes). However, once I left Morocco to study abroad, I started to question the bilingualism with which I had grown up. In my country, French and Arabic did not always have a harmonious relationship; rather, they were often in competition in the public sphere. I started to feel really uncomfortable with the idea of writing fiction using the colonial tongue. At the same time, I had been working on my dissertation at USC, and I had to use English daily. That’s how the idea of writing fiction in English came about. Ideally, I would have written in my native language, but since I could not, it seemed that English was my only other option. And between writing in English and not writing at all, I made the choice of writing. /One/: How does it benefit or detriment your readers, if at all? LL: I would hope that good fiction, by which I mean fiction that tells us a truth about the human heart, is of great benefit to readers, no matter what language it is told in. /One/: In many ways, you are acting as a translator before you even put words on the page—meaning you’re translating ideas in your native Moroccan culture into something we can understand. How important do you think this is in our understanding of other people/cultures? LL: I don’t know if the role of the novelist is to translate a particular culture. It is enough that the novelist try to tell the most specific, the most complex, the most truthful story she can tell. And it is that specificity, that complexity, and that truth which eludes us so much in our perceptions of other people. /One/: Do you consider yourself particularly inventive with your usage of English? How is it different from the typical translation where the original text, written in a native language, is translated by someone else? LL: I do play with language in my work, but in ways that may be invisible to some readers because this playfulness is characterized by absences. For instance, I try to excise from my text any American idiomatic expressions because they are often culturally specific and my characters wouldn’t be using them. I also add in words from Moroccan Arabic that are hard to translate in simple ways. For example, it is easier to use “tagine” than to say “a stew of meat and vegetables cooked in a clay pot.” I don’t know whether my process is similar to or different than one involving a translation because I haven’t had experience with translation myself. /One/: One’s nationality can certainly differ from how one identifies culturally. How do you identify—Moroccan, Moroccan-American, African, other?—and how does that affect your relationships and the communities in which you work and live in? LL: I identify as all those things—and others besides: woman, Arab, Muslim, progressive, and so on. I think one’s identity is fluid, and different sides of it can be reinforced depending on the social, political, or cultural situation. 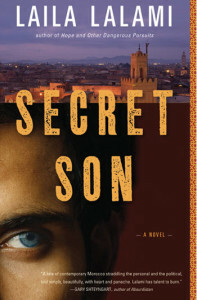 /One/: When you first started thinking about your new novel, Secret Son, were you intentionally trying to tell the story of the tension between classes in Morocco, or did you start with a character and the story took off from there? LL: I remember clearly the moment, six years ago, when I started writing Secret Son. I had this image in my mind of a young man, walking back home in the rain to the shack he shares with his mother, having just watched a movie at a nearby theater. I followed that image for years, trying to figure out who this man was by putting him in increasingly intense dramatic conflicts with people around him. It turned out that the story was about Youssef, a young man from a slum near Casablanca. He has grown up all his life thinking he was the son of a respectable schoolteacher who died in a car accident, but at the beginning of the novel, he finds out that he is in fact the son of a wealthy businessman, so he decides to go find him. It’s this journey that frames the entire novel. /One/: You’ve mentioned in previous interviews that you identify with the protagonist, Youssef El Mekki, a young man born into poverty, yet your own background isn’t similar to his. Whose story are you telling and why was it important to you to tell it? LL: I am telling the story of my characters. Whether I have something in common with them is beside the point—the point is for the writer to use her imaginative empathy to create the most complex, most fully realized character she can. /One/: In your opinion, does literature play an important role in promoting tolerance and awareness? LL: Literature is the only art that allows us direct access to the minds, thoughts, and feelings of other people. So in that sense, yes. /One/: Who were some of your influences? Can you recommend Moroccan writers or artists who have influenced you to /One/ readers? Who are some current writers that you admire? LL: I think that perhaps it might be more appropriate for readers and critics to tell which influences are apparent in my work. All I can tell you is that everything I live, read, hear, and experience influences my work. I can of course recommend several Moroccan writers I admire: Driss Chraibi, Leila Abouzeid, Mohammed Choukri, Mohammed Khair-Eddine, Fatema Mernissi, and Abdellatif Laabi. Other contemporary writers I admire include J. M. Coetzee, Chinua Achebe, Ahdaf Soueif, Margaret Atwood, and the late Tayeb Salih. This entry was posted on Tuesday, September 1st, 2009 at 5:08 pm	and is filed under Interviews. You can follow any responses to this entry through the RSS 2.0 feed.